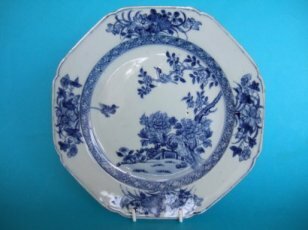 A Chinese Export Blue & White Plate. c.1750. 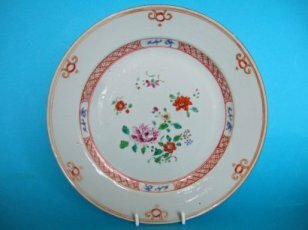 A Chinese export porcelain octagonal plate dating from around 1750-60. Painted in underglaze blue with an attractive central scene of small birds among flowering plants and rockwork in a fenced garden. The rim decorated with flower sprays and a diaper pattered border at the cavetto. Measures 21.5cm. (8.5 inches) diameter. Quite good, a couple of faint hairlines from the rim, and very minor fritting to the edge of the rim. 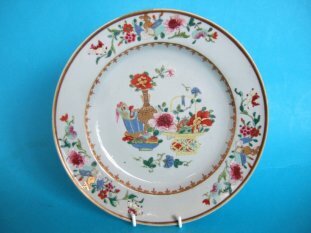 A Chinese famille rose plate dating from the mid18th.Century. Attractively decorated with vases and a basket of flowers and fruit. The central decoration surrounded by a dagger border. The rim painted with flower sprays, a gold vessel and a cricket cage. Measures 21.8cm. diameter. The plate has one or two minor frits and a faint stabilised crack from the rim. The decoration is in very good condition. 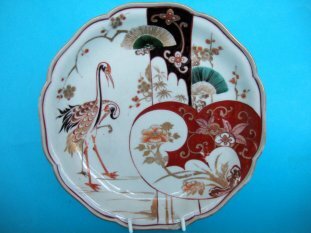 An attractive Chinese famille rose palette plate dating from the mid 18th. Century. Decorated to the centre with flowers sprays and sprigs surounded by a diaper patterned border at the cavetto. Measures 22cm. (8.5 inches diameter. It has no marks. A faint hairline from the rim and minor fritting. Unfortunately has a chip to the rim and a short tight hairline crack. A little wear to the enamels and gilding.